On the cover: Photomicrograph at 400X magnification of a ruby-throated hummingbird feather showing expanded nodes on the left vanule and less expanded nodes on the right. See Microscopy of Feathers: A Practical Guide for Forensic Feather Identification by Carla J. Dove and Sandra L. Koch. The Microscope 59 (2), pp 89-91. 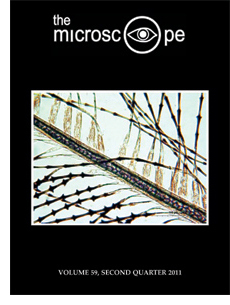 Originally published in The Microscope, Vol. 19, No. 3, July 1971.